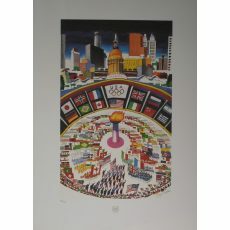 Dong Kingman was commissioned and created America Hosts the Athletes for the 1996 Atlanta Olympic Games. Dong Kingman was born Dong Moy Shu on March 31, 1911 in Oakland, California. He began making pictures and drawings at the age of five when his parents took Dong and family from Oakland to Hong Kong, where he attended the Lingnan School. The School Master, Mr. Ssetu Wei, an art student who had just returned from Paris, took an interest in Doug. He taught him the elementary technique of oil painting and, occasionally took him and a few of the art students to pain from the hilltop near Happy Valley. Dong returned home in Oakland when he was 18 at the height of the Depression. He began selling newspapers and worked on odd jobs like working as a cutter in a garment factory, washing dishes. He bought a restaurant with his savings but when the roof caved in, he went to work as a houseboy for a family in San Francisco. He painted every Sunday morning which was the only time he had off in the week. In a year, he painted enough pictures to give an exhibition at the Art Center. Instantly, it attracted the attention of San Francisco’s art critics who unanimously raved about the brilliant color presentations and unique style of the new young Chinese painter. Dong Kingman became an overnight success. When he came out of the Army at the end of WWII, he was first accepted by the WPA (Works Projects Administration) for artists, writers, etc. He then won two Guggenheim Fellowships which enabled him to travel and paint all over the United States. He gave his first exhibition in New York in 1945, taught at Columbia University and Hunter College and was voted into the National Academy of Design and the American Watercolor Society in 1951. In 1954, the U.S. Department of State invited him to go on a cultural exchange program tour around the world to give exhibitions and lectures and to meet local artists. He came home with a 40-feet long report on a scroll to the State Department, which later appeared in six full pages in LIFE Magazine. 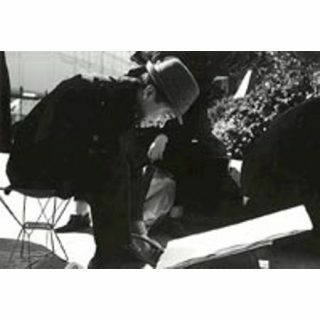 His work includes exhibitions in most major cities in the United States; London; Paris; Rome; Moscow; Prague; Warsaw; Jakarta; Manila; Singapore; Bangkok; Hong Kong; Brasilia; a major touring exhibition in Mainland China; and most recently an exhibition of 150 paintings and drawings at the Taipei Fine Arts Museum. His paintings are also featured in some 40 major museums and were important in many private collections in the U.S. including famous icons Charlton Heston, Frank Sinatra, Henry Luce and also the former King of Spain, Juan Carlo. In the 1960’s, Kingman was actively involved with motion picture productions. He is completed on a documentary film about himself with commentaries made by his good friend, Charlton Heston. He was awarded by the Art Galleries Owners Association of Taiwan a gold medal for The Best Chinese Artist in the World outside China.